Starting in February 2011, and continuing on for the next eight years, mankind now has its first ever 360 degree view of a star - our own Sun. By combining images from NASA's Solar Terrestrial Relations Observatory (STEREO) Ahead and Behind spacecraft, together with images from NASA's Solar Dynamic Observatory (SDO) satellite, a complete map of the solar globe can be formed. Previous to the STEREO mission, astronomers could only see the side of the Sun facing Earth, and had little knowledge of what happened to solar features after they rotated out of view. Would active regions grow larger, and affect the space weather environment when they rotated back again two weeks later, or would they decay away? What about new active regions forming on the far side of the Sun, waiting to surprise us? With STEREO's 360 degree view of the entire Sun, that will no longer happen. Rotating solar globe combining images from the STEREO-Ahead, STEREO-Behind, and SDO, taken on 4 January 2011 in the Helium II emission line at 304 Angstroms. The small black wedge on the far side of the Sun was filled in starting February 2011. This Quicktime movie shows the wedge closing between February and June 2011 as STEREO A and B moved further towards the farside of the Sun. STEREO is able to accomplish this feat because of the unique orbits of its two spacecraft. Each spacecraft is in its own orbit about the Sun (a heliocentric orbit) with orbital parameters that differ just slightly from those of Earth. It's these slight differences that make all the difference. The STEREO-Ahead spacecraft has an orbit that is a little bit closer to the Sun than Earth, and therefore orbits a little bit faster. STEREO-Behind, on the other hand, has an orbit just slightly outside Earth's, and is thus a little bit slower. The end result is that each spacecraft seems to slowly drift in opposite directions away from Earth by about 22 degrees per year, as illustrated below. Although, as seen from Earth, the two spacecraft seem to be going in opposite directions, they're really going in the same direction, just at different speeds. This Quicktime movie shows the STEREO orbits as they would be seen by a hypothetical observer above the solar system. The green dot represents Earth, and the red "A" and blue "B" represent the STEREO "Ahead" and "Behind" spacecraft respectively. The yellow dot represents the Sun. The orbits of Mercury, Venus, and Mars are also shown. Note that the orbits of the two STEREO spacecraft differ not only in their orbital distances, but also by how much that distance varies over the orbit. This property is described by a parameter known as the orbital eccentricity, denoted with the symbol e. A perfectly circular orbit would have e=0. STEREO-Ahead's orbit is very close to circular, with e=0.006, while that of STEREO-Behind is more eccentric (e=0.042). The eccentricity of Earth's orbit falls somewhere in between (e=0.017). Getting the STEREO spacecraft into orbit around the Sun was not simple. It involved using the Moon's gravity to "slingshot" the spacecraft in their proper orbits. Both spacecraft were originally launched together on a single Delta II rocket on 26 October 2006. Immediately after launch they are placed into highly elliptical orbits that range from just a few hundred kilometers above Earth's surface out to a little beyond the distance of the Moon. Over the next few weeks the two spacecraft slowly separated from each other, and the Mission Operations carefully adjusted the orbits of each to line them up for when both flew by the Moon a few minutes apart on 15 December 2006. The Moon's gravity grabbed both spacecraft, and flung STEREO-Ahead completely away from Earth into its orbit about the Sun. STEREO-Behind was also flung out, but not completely, and came back to swing by the Moon again on 21 January 2007, when it was then completely flung away in the opposite direction into its own orbit about the Sun. These motions are demonstrated in this Quicktime movie where the green and grey dots represent Earth and the Moon respectively, and the red "A" and blue "B" represent the STEREO "Ahead" and "Behind" spacecraft as before. The first step in making a map of the solar globe is to find two STEREO images taken at the same time and in the same wavelength. This is fairly simple, because the observing schedules of the two spacecraft are coordinated so that both should be doing the same thing at the same time. There are a couple of small effects, however, that need to be taken into account. Since the STEREO-Ahead spacecraft orbits closer in, light from the Sun reaches it earlier than it reaches STEREO-Behind. This is taken into account by delaying the STEREO-Behind images by an appropriate amount so that we are imaging the same moment on the Sun. Depending on where the two spacecraft are in their orbits, this delay can be anything from a few seconds up to as much as a minute. However, the amount of delay is known, and it's quite simple to match the images from one spacecraft with the other. The other effect that needs to be taken into account is that the amount of available telemetry for each spacecraft varies from day to day depending on the scheduling of the ground stations. Thus, on any given day, one spacecraft might be able to take more images than the other. However, this is taken into account in the scheduling so that there's always a subset of images that are coordinated between the spacecraft. Next, the position on the solar surface of each pixel in the image is computed. To do this, we need to know both where each spacecraft is, and how it is pointed. The position of each STEREO spacecraft over time is carefully tracked by the NASA Flight Dynamics Facility. A number of different coordinate systems are used for tracking spacecraft in the solar system, but the easiest to describe is the ecliptic system. The ecliptic plane is defined as containing Earth's orbit, and the two STEREO spacecraft also orbit close to this plane, with only slight inclinations (0.13 degrees for STEREO-Ahead, and 0.29 degrees for STEREO-Behind). Thus, we can describe the position of each spacecraft by how far along it is in its orbit (the ecliptic longitude), how much it's above or below the ecliptic plane (the ecliptic latitude), and by how far away it is from the Sun. However, what we really want to know is where each spacecraft is relative to the Sun's own coordinate system, known as heliographic coordinates. Like other astronomical bodies, the Sun has a rotational axis with a north pole and a south pole. This rotational axis is inclined by about 7.3 degrees to the ecliptic axis, so that part of the year we see the Sun's north pole tilted toward us, and sometimes the south pole. From the orbital position of each spacecraft, we can calculate where it is in heliographic longitude and latitude. Image from STEREO-Ahead with lines of constant heliographic longitude and latitude overplotted. We also need to know the pointing of the spacecraft at the time of the observation. This can be described as the position of Sun center in the image, and also by the orientation of solar axis in the image, known as the roll angle. In the above image, one can see that the solar axis is not quite straight up-and-down. This is because the STEREO spacecraft are oriented to keep their high gain antennas pointed toward Earth, effectively maintaining a constant roll of about 0 in the ecliptic coordinate system. Thus, the solar axis can be off by as much as +/- 7.2 degrees from straight up-and-down. (The browse images on the STEREO website have been corrected for roll.) Like the orbital position, the orientation of the spacecraft as a function of time, both in terms of the pointing and the roll, is also carefully tracked. After the coordinates of the STEREO images have been determined, the images are converted into heliographic maps such as in the examples below. Only pixels that are inside of the disk of the sun are used, since unique heliographic coordinates cannot be calculated above the limb (the term used to refer to edge of the Sun's disk). This would be fine if all the emission was coming from the surface, but it's clear from the above image that the Sun has an atmosphere (called the corona) which extends well above the surface. Vertical features at points near the limb will tend to be projected nearer to the limb than their actual heliographic position. In the heliographic maps this shows up as smearing near the edges of the map; this is expected. Image from STEREO-Ahead converted into a heliographic map. Zero longitude represents the direction towards Earth. If we only had the STEREO images, we'd have a good view of the far side of the Sun after February 2011, but would start to lose the parts of the globe on the side facing Earth. Fortunately, we can fill this part of the Sun with images from the SDO satellite. SDO observes the Sun in three of the four wavelengths seen by STEREO: in the Helium II emission line at 304 Angstroms, representative of plasma at about 80,000 degrees, the Iron IX line at 171 Angstroms (1.3 million degrees), and the Iron XII line at 195 Angstroms (1.6 million degrees). SDO does not have a bandpass equivalent to the Iron XV line at 284 Angstroms (2 million degrees) seen by STEREO, but the slightly cooler Iron XIV line at 211 Angstroms is a reasonable substitute. SDO images are not taken at exactly the same time as the STEREO images, but the SDO cadences are so high one can usually expect to find an image at the right wavelength within a few seconds of the STEREO observation. Occasionally this is not the case; for example there are calibration periods when suitable data are unavailable. In such cases the nearest SDO image is found, and a correction is made for the solar rotation. The Sun rotates about once every 25 days (sidereal rate). However, because the Sun is gaseous and not a solid body, the rotation rate is not constant; it varies as a function of latitude. This is known as differential rotation. Also, because the spacecraft are also orbiting about the Sun as it rotates, the apparent rotation rate is somewhat lower (synodic rate), about 27 days. When the SDO images are corrected for rotation, both of these effects are taken into account. The same procedure applied to the STEREO images are also applied to the SDO image, resulting in three heliographic maps which are then combined to make a single map. Where the maps overlap, the one where the observation is closest to solar disk center is used; this minimizes the effect of smearing at the map edges. Also, since the SDO telescopes are not identical to those on STEREO, the brightnesses is not be exactly the same, so adjustment factors are applied to the SDO maps to better blend in with the STEREO maps. Heliographic map made with combined data from STEREO-Ahead, STEREO-Behind and SDO from Dec. 30, 2011. Once a combined heliographic map is obtained, we can then reproject this back into a three-dimensional globe viewable from any arbitrary direction, using essentially the inverse of the processed used for making the maps in the first place. Of course only the solar surace is modeled, not the coronal emission above the limb, so it's not quite a true three-dimensional representation. In the rotating globe movie above, a series of 36 back projections were made, rotated by 10 degrees of longitude between each step, to give a full 360 degree view. The separation between the STEREO Ahead and Behind spacecraft exceeded 180 degrees on 6 February 2011. On this date the two spacecraft viewed the Sun from completely opposite directions, thus viewing the entire Sun. After that date, the spacecraft started to approach each other on the far side of the Sun, and SDO data were needed to fill in the Earth-facing side that STEREO no longer sees. Although one can say with honesty that the entire Sun was seen after 6 February 2011, a small gap still persisted in the heliographic maps for several days after this. This effect is due to perspective. 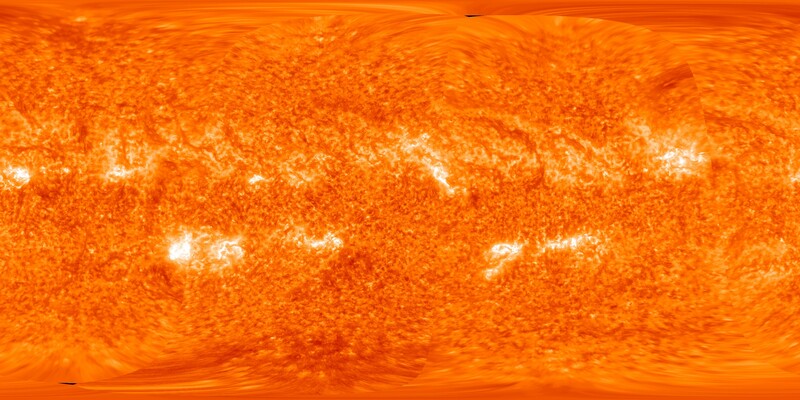 From a distance of about 150 million kilometers one does not see exactly one half of the mathematical solar surface. Instead, the solar horizon is be slightly smaller than 90 degrees away from Sun center. This is really a limitation in the way that the heliographic maps are formed, because the solar emission is not coming from a mathmatically flat surface, but from an extended atmosphere with thickness above that theoretical surface. In the images, emission from this part of the Sun is seen above the limb, but that observed emission does not show up in the maps. The gap in the maps gradually disappeared over the next several days, starting in the northern hemisphere, and was be essentially gone by 12 February 2011, although some remnant persisted in the regions near the poles.